To many people Bounty is the ultimate embodiment of summer. To be honest, I never really cared much for Bounty bars or Mounds (if that’s what they’re called in your country). That was until I made them myself. Why did I make them anyway? 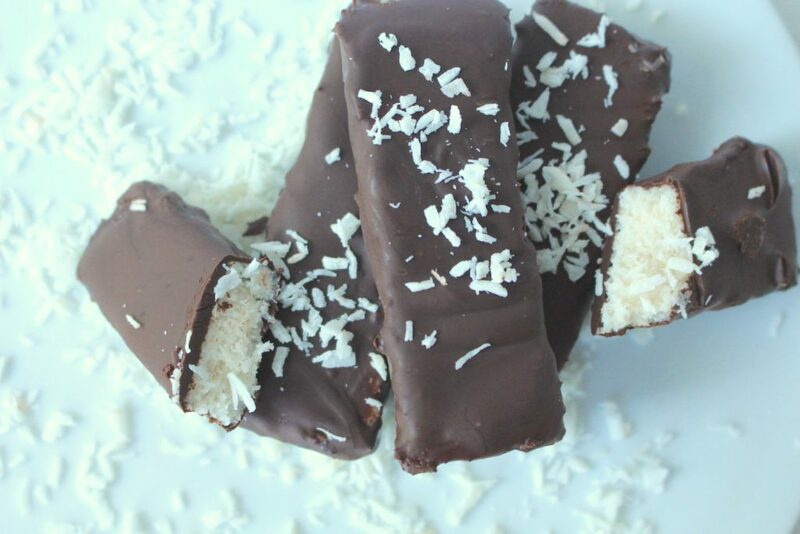 After I shared my healthier Raffaello recipe, a few asked me if I could create a healthier version of these coconut chocolate bars as well. So I experimented a little with pretty much the same ingredients of my coconut balls as a filling for the bars and coated it all with homemade chocolate. In the end, not only are those who asked very happy with the result, but I can’t stop eating these bars either. For my taste these bars really are better than the original. But don’t just believe me, try it yourself! 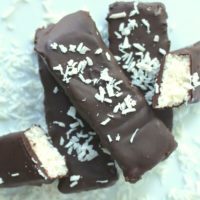 Not only are these coconut chocolate bars (aka Bounty Bars) quick and easy to make, but also healthier than the original. Fresh our of the fridge, these make the perfect summer snack. To a bowl add all of the filling ingredients ans mix to combine. Knead with your hands to combine well. Press onto small baking dish or plate (I used a small plate of 6 x 6 inches) and let set in the freezer for at least 2 hours. If making your own chocolate: melt together all of the ingredients in a simple double boiler and mix well. Alternatively: Melt ready-made chocolate with the double boiler method. Cut coconut filling into bars (I ended up with 12 individual bars, each about 3 inches long). Prepare an oven rack over a baking sheet. 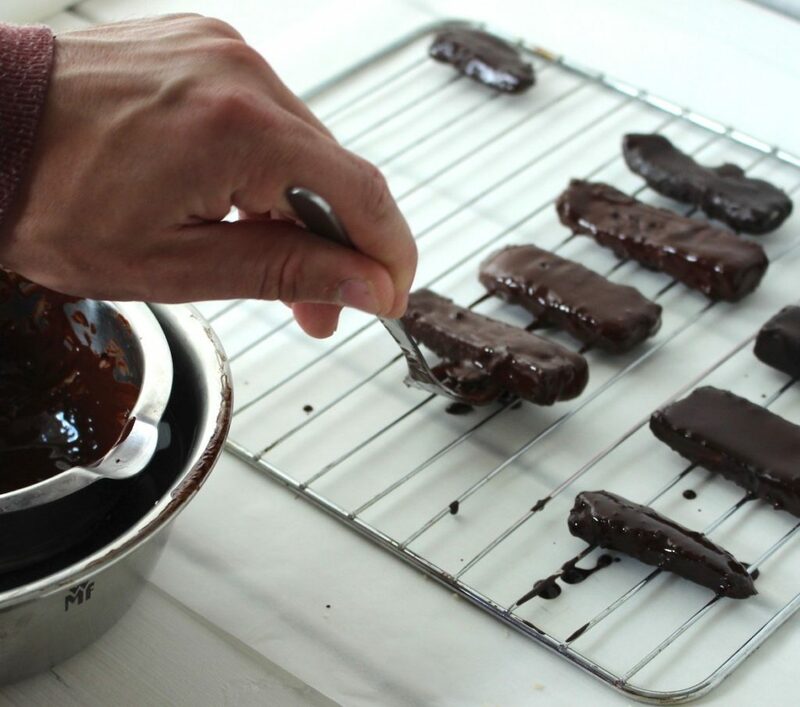 With a fork dip each bar into the melted chocolate, making sure it's coated from every angle. Then place on oven rack and continue with remaining bars. Makes 12 individual bars of about 3 inches length. 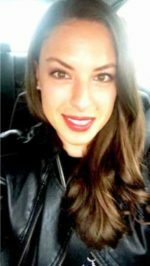 Coconut butter is not the same as coconut oil. You can make your own coconut butter as described in this post. If store-bought coconut butter is solid, melt in a double boiler and mix well as the coconut fat may have accumulated to the top. Instead of making the chocolate from scratch, you could also buy dark chocolate and melt it before using. I hope you love this recipe – please let me know in the comment section below! If you make these coconut bars, make sure to take a photo and share it on my Facebook page or on Instagram, using the hashtag #minamadefood. Oh and don’t forget to tag me (@thisisminamade) so that I can see your creations!